Art Clay World approved senior instructor Julia Rai teaches this independent three day advanced skills Art Clay Diploma Level 2 metal clay qualification. This is a private class with all materials included and instruction on a one-to-one basis. Contact us to arrange a suitable date. Holders of the Art Clay Diploma Level 2 enjoy 20% discount on Art Clay products from the official distributors. Art Clay World approved senior instructor Julia Rai teaches this independent three day advanced skills Art Clay Diploma Level 2 metal clay qualification course. This is a private course with all materials included and instruction on a one-to-one basis. Contact us to arrange a suitable date. Aida Chemicals, the manufacturer of Art Clay, have set the curriculum for this course, in association with the European Art Clay distributors. Because of this, the qualification is recognised across Europe. Holders of the Art Clay Diploma at Level 2 are permitted to run introductory Art Clay classes. More importantly they also get a 20% discount on Art Clay products from the authorised distributors. Find out more here. This Art Clay Level 2 Diploma course is fully taught by Julia Rai. You will be able to look at completed sample pieces allowing you to really understand the requirements. You will also have step by step samples as examples to show you what you need to achieve at each point. Julia will do demonstrations and give you hands-on, individual assistance and direction. The pieces you produce will be your own work. However, you will have Julia’s expertise and experience at every step, helping you to achieve the standards required. Students are required to complete four complex projects at Art Clay Diploma Level 2. They must also meet the designated standards for each piece. Before attending this course, you should first have attended and passed the Art Clay Diploma Level 1. You must bring your Certificate with you if you attained the Level 1 with another instructor. What is included in the cost of this class? The class cost includes all materials and the Art Clay World Level 2 Diploma fee. Holders of the Art Clay Diploma Level 2 enjoy 20% discount on Art Clay products from the official distributors. On successful completion of this level, you will be eligible to progress to the Art Clay Higher Diploma. This level has no classes; you are required to design and make three pieces to set criteria without guidance from a teacher. Before submitting your pieces for the Higher Diploma you will need to wait six months from the date of your Level 1 class. Holders of the Higher Diploma get 30% discount on Art Clay products. They can also teach Level 1 and 2 Diploma classes. Why choose the Art Clay Diploma? The Art Clay Diploma metal clay certification is the most beneficial precious metal clay qualification available. Not only do you get training in a variety of advanced metal clay techniques, you also get discounts on Art Clay products. This discount is a huge benefit if you are going to make working with precious metal clay your business. Or even if you want your hobby to cost you less! 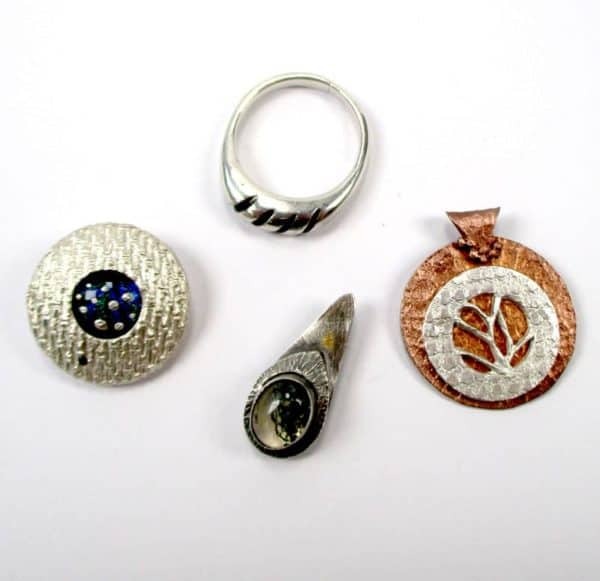 If you also want to learn traditional silver working techniques, adding colour, texture making or working with other brands of metal clay, take a private class with Julia Rai. You can set your own agenda and learn exactly what you need. All of the techniques included in other, less beneficial metal clay qualification courses can be learned in a private day with Julia. The total cost of gaining the full Art Clay Diploma metal clay qualification at CSACJ is below. Add a private one day class with Julia Rai at £200 to cover anything else you want to learn. Bring your own materials on the private class if necessary at the discount you will receive having passed the Art Clay Diploma! Even if you did this the most expensive way – all as individual private, one-to-one classes including the private class to learn other skills – the total cost would only be £1515. Compare that to the total costs of other metal clay qualifications. And how much will you save on buying metal clay in the future with your discount? Can other precious metal clay certification courses offer you that? Before you book a precious metal clay qualification course, compare the total costs. Really consider the benefits and merits of each and decide what you want. Look at the skills learned, the techniques covered and think about the value for money. Also consider the lifetime financial benefits of the Art Clay Diploma against other metal clay qualification courses. Make sure you spend your hard earned money on something that is worth getting. If you have any questions, Julia is happy to discuss these with you. Call her on the number above or send an email through our contact page. I had a lovely time with you; learnt a lot, covered new things, picked up a lot of good tips from you and most of all came away with confidence, not questioning what I am doing, so many many thanks. I’m sure I will be back sometime.